Location: Situated on the W side of the road through Abercych, some 100m from the junction with the B 4332. 1868 Baptist Chapel replacing one of 1826. 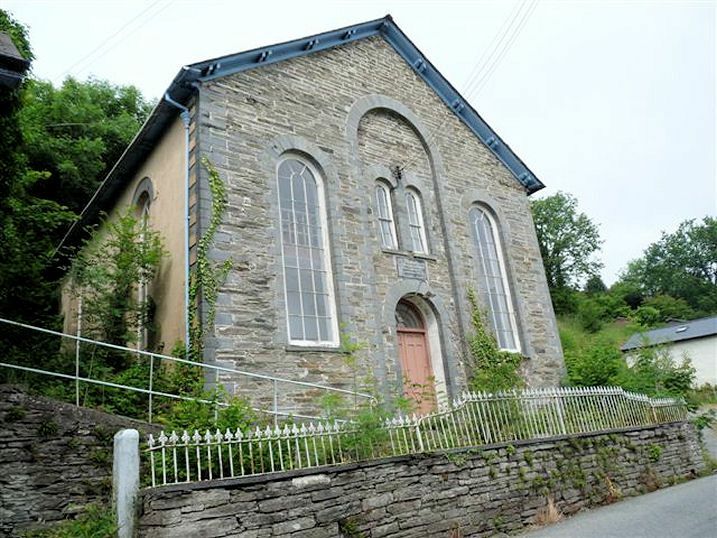 1868 Baptist Chapel in rubble stone with cut Cilgerran stone dressings and slate roof. Paired brackets to eaves. Gable front with two long arched side windows, centre tall narrow arched recess over pair of arched small windows and arched door. Small paned windows with marginal glazing bars. Double 6-panel doors and fanlight with concentric bars. Plaque 'Ramoth' Addoldy y Bedyddwyr Adeiladwyd 1826, Ailadeiladwyd 1868'. Two long arched windows each side, two to rear. Three-sided gallery with long horizontal panels, on cast-iron fluted columns. Curved gallery corners. Box pews, and pulpit with curved front, steps up each side with carved finials to newel-posts. Included as unaltered example of a mid-Victorian country chapel, still with the small-paned windows and box-pews of the earlier chapels.